Health Infrastructure for the NHS in Northern Ireland has followed a distinctive path from the rest of the UK. Under the control of the Northern Ireland Department of Health for much of the last 30 years, buildings have been commissioned placing a high value on quality and local partnerships. As a result, the province has some of the best recent health buildings developed to provide NHS services. 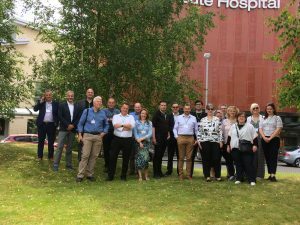 The Architects for Health 2018 study tour organised with the generous support of sponsors Axis Entrance Systems and contractors, McLaughlin & Harvey Construction visited a range of Acute, Sub-acute and Community Health Facilities. HLM Architects hosted the welcome event at their central Belfast office. As the 21 members of the Study Tour gathered there was time for networking in a convivial setting with wine and food. The event was kicked off by John Cole, who had been a huge support in helping arrange some of the visits. John’s presentation gave a wide-ranging overview of his time as head of Northern Ireland Health Estates, the objectives and what they had achieved. This focussed minds and provided an excellent starting point for the tour. The first full day commenced with a visit to Omagh Hospital and Primary Care Complex in the west of the province. 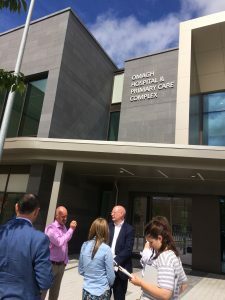 Opened in 2017, the new £105m complex reprovides services from the old Tyrone County Hospital bringing together GP’s, Urgent Care and a range of Treatment Services with 40 step up/down beds. 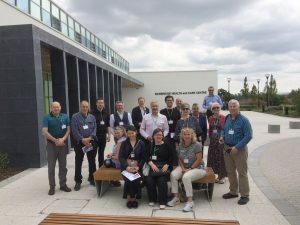 We were met by Andrew Murray and Paul Crowe of Todd Architects and Donna McFarland of the Western Trust who have an overview of the development and features of the impressive new development. The party split into smaller groups to tour the building. Inevitable with such an interesting building, the visit overran and we were late for the lunch hosted by McLaughlin and Harvey at Omagh Golf Course. The South West Acute Hospital opened its doors to patients on 21 June 2012. The new PFI Hospital re-provided services from the old Erne Hospital and is one of the most attractive large hospitals in the UK in a terrific lakeside setting. The new hospital has up to 210 in-patient beds and 22 day-case beds. The hospital delivers a full range of acute services for the south west of the province, a largely rural population where road travel times limit access. We were met by Anita McConnell of the Western Health & Social Care Trust who have polished overview of the history of the development of which staff are clearly proud. Burkhard Musselman of Stantec provided an overview of the layout and the party was greatly helped by Jane McElroy’s oversight of the development. After the visits to the emergency department, wards, outpatient and engineering areas, the party returned to Belfast. After visiting facilities planned for rural populations the visit to the Ulster Hospital is the major acute hospital for the Trust and delivers the full range of acute services for the more urban population around Belfast. 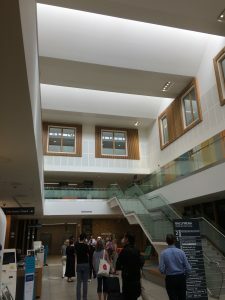 The visit to the new 6 storey 30,000m2 Inpatient Ward block designed by Avanti Architects with Kennedy Fitzgerald Architects provided an overview of the planned comprehensive redevelopment of the hospital. Kieran Quinn and Maureen Toner of the South Eastern Health & Social Care Trust who provided an insight of the integration of clinical services across the hospital during the multi-phase redevelopment. Andrew McKeown of Avanti described the evolution of design and features with modesty and understatement. Circulation through this complex medical environment is a pleasure with daylight and views of gardens with artwork whilst the clinical spaces and patient rooms showcase exceptional detailed design. After a picnic lunch on the banks of the River Bann the party visited the award winning Bambridge Health and Care Centre. The primary and community health centre model is a distinctive feature of health and social care in Northern Ireland. Although a small building the architects have used the sloping setting to create layers of overlapping functions with stepped and beautifully landscaped courtyards making an exceptionally rich environment. 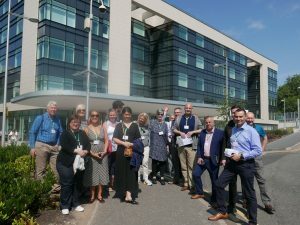 We were welcomed by Sharon Radcliffe of the Southern Health & Social Care Trust and Damian Day of Kennedy Fitzgerald Architects who with Andrew McKeown of Avanti led the tours of this exceptional new facility. Short of time the party headed north for the final visit of the tour. The excellent new Health and Care Centre for the Northern Trust area, provides a one-stop centre for assessment, treatment and provision of care to the local population. Services in the facility include 6 GP practices and a local pharmacy as well as a mix of locally accessible acute, primary and community care clinics. Arriving a little late we were met by Tim Harland of Hoskins Architects who with co-creators Keppie Design planned and designed this beautiful and rich new facility. Alison Renfrew and Diane Power of the Northern Health & Social Care Trust introduced and facilitated tours of this building which brings together a wide range of services in a modern and attractive setting. Our speaker this evening is Henry Marsh one of the UK’s most eminent neurosurgeons. After graduating with a First in PPE, at Oxford he studied Medicine in London, subsequently training as a neurosurgeon. His work has been the subject of two major BBC documentaries – “Your Life in their Hands” in 2003 and “The English Surgeon” in 2009 which was described in the New York Times as “Enthralling, astonishing…agonizingly human” and in the London Times as “the most moving and honest film about surgery I have ever seen.”. In 2017 he published a second book Admissions, which became a Number 1 Sunday Times best seller and received reviews as enthusiastic as for his first book. Although retired from full-time work in the NHS he continues to work in diverse countries such as Ukraine, Nepal, Albania and Pakistan. He is a passionate defender of the NHS and has a long-standing interest in the influence of the hospital environment on patient health and staff morale. He doesn’t speak too highly of healthcare architects but can only be an ally and a friend when he challenges on patients in NHS hospitals who ‘rarely get peace, rest or quiet and never a good night’s sleep’. He was made a Commander of the Order of the British Empire by HM the Queen in 2010. A man who talks about stage fright at the start of a case; whose profound quotes on quality of life and death are too many to mention. 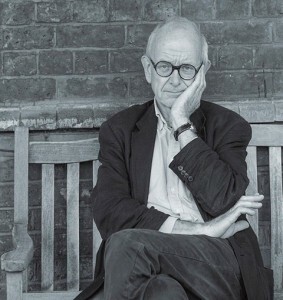 Henry Marsh has a passion for healthcare environments, mostly because he has worked in them for over 40 years but also because if he hadn’t have been a doctor he suspects he would have studied architecture. He started his neurosurgical career at the Atkinson Morley Hospital which was founded by a philanthropist who had suffered a hospital stay at Charing Cross and been disturbed by the sound of carriages at Trafalgar Square so gave money for the building of a hospital in the leafy suburbs of south London. Now the site of the Atkinson Morley is ‘rich trash housing’ and the patients and staff suffer the unpalatable scale of St George’s Hospital, Tooting. Henry took us on a rapid journey from the pseudo-science of the ancient Egyptians to the pseudo-science of cryogenics and invited us to consider having our heads stored in dry ice for the future. We now have an insatiable appetite for healthcare. In the USA it will consume 20% of income by 2020 and we spend 26% of the cost in the last year of life. Both the pyramids and Chartres Cathedral are built expressions of our fear of death. As are Hospitals. So why are hospitals so horrible? Hospitals are biological hazard areas; they are full of windowless spaces or high windows; multi bed bays are grotesque. Who is the client and is he informed? Take the Aga Khan Hospital in Karachi. Beautiful and aesthetically pleasing because the Aga Khan acted as client. But it doesn’t function as a hospital. We have an ideological faith in technology and hospitals are becoming so complex they are no longer humane. The knowledge is there to do better. Take intensive care at the Karolinska (or anywhere) where the sound levels were intolerable and the patients felt as if the nurses were just waiting for you to have a heart attack to spring into action. A project to change the ceiling tiles improved rest and recovery of patients and was shown to reduce readmission rates. Much of modern medicine is palliative care not cure; it is changing all the time and is technologically complex. In recent times alone stents and statins have made cardiothoracic surgeons redundant. Change is occurring at an unrelenting pace. So where is the incentive to build a well-designed, sympathetic hospital? It is extraordinary how much difference can be made by windows with views and natural light. And size matters – as a neurosurgeon it makes sense to consider Dunbar’s Number; the size of the human brain correlates to the ideal social group size in which humans function well. For humans that number is about 150 numbers, reflected apparently by the typical number of Christmas cards or mobile phone contacts lists. Staffs in hospitals need to feel comfortable amongst the team; they need to feel a responsibility for what is happening. Hospitals need to function more like regiments which generate institutional pride. Good offices and good coffee rooms are important because people need to talk. Surgeons need to learn detachment but not be too detached. There was time after Henry finished talking for a few questions. It was noted that he had poked a bit of a stick at healthcare architecture and it was clear that the audience enjoyed the presentation – available on SlideShare. Reshaping NHS Infrastructure: Will integrated care centres do the trick? Dr Patricia Oakley is a woman on a mission. Having qualified originally as a pharmacist and becoming London Chief Pharmacist in the early 1980s she didn’t stop there. She has a masters and a doctorate; teaches and undertakes research at Kings College, London and is a Director at Practice Makes Perfect. She splits her time between London and the West Country. David Powell Development Director at Alder Hey Children’s NHS Foundation Trust can rightly be regarded as one of a very exclusive group within the NHS considering the total NHS workforce of 1.4m staff, David is doubtless one of handful – an expert client lead with a string of successful projects in his portfolio. The annual light-hearted and high-speed exposition of all things healthcare was hosted by NBBJ London on 26th November 2015. A regular and popular feature of the Architects for Health programme, the headline refers to invitations to up to 20 members to present a topic of their choice for no more than 2 minutes. There is no prescribed format and content can be any topic with at least a passing nod to healthcare design and environments. Architects for Health at the Design Council. Registered in England and Wales. Company number: 10651725. Registered office: The Foundry, 7 Glenthorne Mews, London W6 0LJ.